The app is based on the amazing works on optics by Harold M. Merklinger. The app uses the open source code for fast blur algorythm developed by Mario Klingemann. I have developed an app to extend management of depth-of-field (DOF) area in video and photo shooting. This app enables you control your both in-focus and out-of-focus areas, and reach exactly that amount of blurriness that you intend. There are many apps that calculate DOF for you. There are well-known formulas that are used to calculate the near and far edges of the DOF. If you know exactly the settings of your shooting, you will know where to place focus and what aperture to set so that your main subject is sharp in focus. But what happens beyond the DOF? Well, everything is blurred, but how much? Now you can control the out-of-focus area of your shots as well. Visual DOF app will tell you exactly. 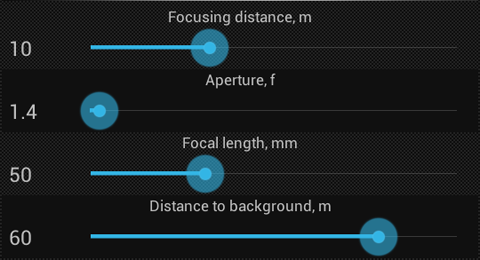 DOF calculations -- classical DOF distances (near edge, far edge, hyper focal distance) based on the settings of your lens. Out-of-focus calculation -- calculation of blurriness of the background. Both visual reference and detailed measurement are available. Estimation of human subject look -- display of how big the human subject would look in the shot. There is also a function of human subject size lock, while varying the focal length and the focusing distance (see below). 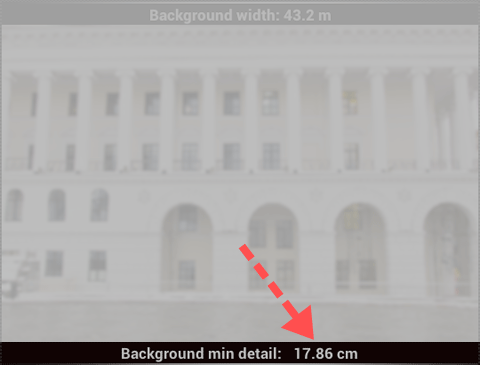 Introducing to you the tool that besides calculating the classical DOF parameters (near end, far end, hyperfocal distance) estimates for you how non-sharp (blurred) is your background. In fact, you can estimate the blurriness of any object if you know how far it is placed from your camera. First thing the app provides you with the visual of your background and how non-sharp it would be. Just set and change various shooting parameters and witness how much the blurriness and the visual width of the background changes. Note: In Visual DOF Pro you can select one of the three pre-installed high resolution images to use as background. You can also select any image from Gallery to use as background, provided you can specify the factual width of the image from the left to the right edge of the image. 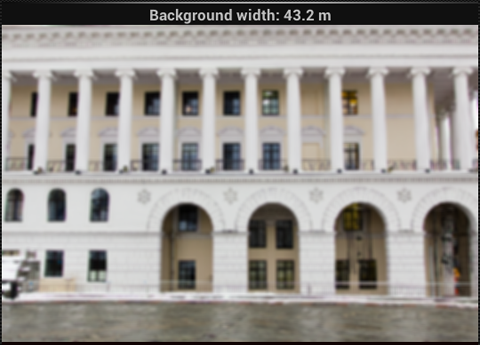 In the lite Visual DOF app you have only one fixed image of the background -- The Tchaikovsky National Music Academy of Ukraine (or Kiev Conservatory), placed on Maydan in the center of Kyiv, Ukraine. To impact the Depth-of-Field, you have 3 shooting parameters to set: Focusing distance, Aperture and Focal Length of the lens. To impact the degree of how much blurred the background will be there is the fourth parameter: Distance to background. Just move the controls below the image to see the difference. Note: In the lite Visual DOF app you can use only the sliding controls to set up the parameters of the camera. In Visual DOF Pro you can type in precise values for each of the setting, even beyond the sliders' range available in the lite Visual DOF version. Now, how can we measure blurriness? Very simple – by the details of the subjects being shot that can or cannot be recognized (’resolved’) in the final image. For example, wrinkles, hair, small letters of logo may be your details. Let’s say, there is a man in the background of your shot with a logo on his shirt, and you don't want the logo to be readable. So you have to estimate the size of the logo (let's say, it’s approx.15 cm in diameter), and then set up the parameters of your future shot so that 'Background min detail' value right below the image is no less than 15 cm. Bingo! Additional great feature of this app is that it helps avoid the artifact called moire. Moire happens to spoil your image when you shoot some fine grid, like texture of fabric. The trick to overcome moiré is to make you subject slightly unsharp to dissolve that nasty grid. Just put your subject out of DOF (so to speak, it will become your background) and make sure that the minimal detail of the background is slightly more than the smallest unit of the grid. In the upper left drop-down menu you can select the Camera/Sensor for which calculations should be done. It's very important to make the right choice or else data will be wrong. You can select from the most popular Canon, Nikon and 4/3 sensors. (You can also enter sensor data manually, if you know what you are doing). Being a fan of Black Magic Cameras, I took liberty to place those cameras on the top of the list of cameras. Hope this will not hamper. Also in the upper right drop-down menu you can select either metric system of units, or feet and inches. Another helpful feature would be estimated look of a human subject that stands in the point of focusing (baseв on her height as approx 180 cm.). Should this feature seem unwanted, you may immediately make the image of the human subject semitransparent or fully transparent by a simple tap anywhere in the background image. Just an additional feature is the lock of human subject size while varying the focal length and the distance of focusing. This could be helpful in a situation when you are sure in how big your human subject must be in your shot, but you are not sure about the background. So you want to decide which lens should be used for this shot. To enter this function, long-tap anywhere on the background image, and feel free to change the focal length or the focusing distance. You will see that the size of the human subject in the shot will remain unchanged. The demo of this feature can be seen in this video tutorial. 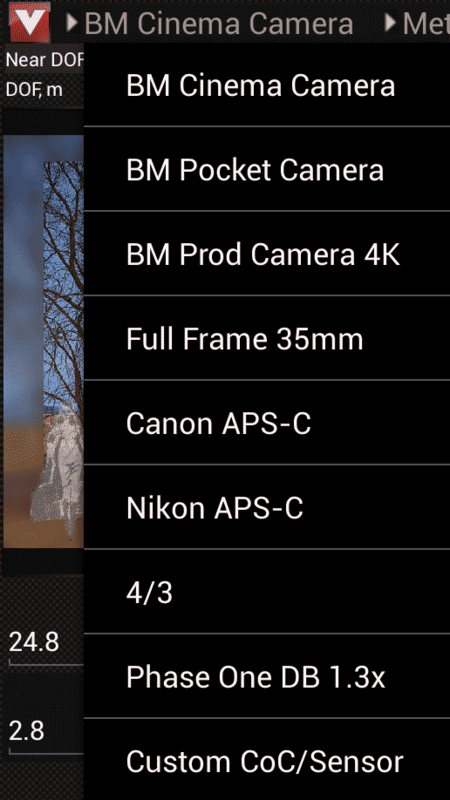 Visual DOF app supports some most popular cameras / sensors. If you feel necessity to add some more, or you think you see any way to make the app better, let me know at dev@kadru.net. This app is fully operational but it needs further support. I will appreciate your positive rating in the Android Play Market and purchase of app. You can also make a direct donation. Thank you!